As I was driving home Saturday night, taking the back country roads and weaving between farms and admiring the festive homes and lawns decorated with twinkling lights and Christmas decorations, God taught me a lesson. The truck in front of me wasn’t small, in fact, it was one of the biggest trucks I’ve ever seen. Because of the size, I couldn’t see around it and was forced to simply follow the truck the rest of the way home being content to only see this big truck’s bumper, tailgate and window and maybe a little bit of light from the sides of his truck. 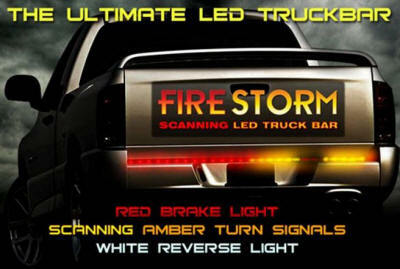 Speaking of lights, the truck had light ropes that flashed when braking. Like this little gem below. Anyway, I was borderline frustrated with this monstrous vehicle because it made me go a little slower than I would have gone on my own and, again, I could only see his big truck, nothing in the path ahead of us. That’s when it hit me. Not the truck, thankfully, but the realization that this giant of a truck was like the Holy Spirit. Sometimes, in our walk with the Lord, you can’t see the next hundred steps, but God allows you to see the next one. Sometimes the walk to our destination, our finished product (He’s bringing us to completion, you know), is slower than we would like and sometimes He seems to be putting on the brakes for no reason other than He sees further down the road than we can (and that’s enough for me to trust Him… at least it is right now in my blog. In reality, it might be different as I’m learning absolute surrender). Therefore, if we’re following Him we need to trust Him, He’s most likely preventing an accident or wreck that involves deer, trees and Christmas yard decorations. What a mess that would be. God doesn’t promise us an entire army of people holding flashlights to light our way, or a future of sunshine that shows exactly what’s ahead on our weaving road that is our walk with Him. But He does promise to be a lamp unto our feet and a light unto our path, which means we see one or two steps ahead–just enough to take the next move in following Him. He promises grace for this moment and if we’re following Him today, He’ll lead us exactly where He wants us tomorrow. This entry was posted in Monday Morning Munch.